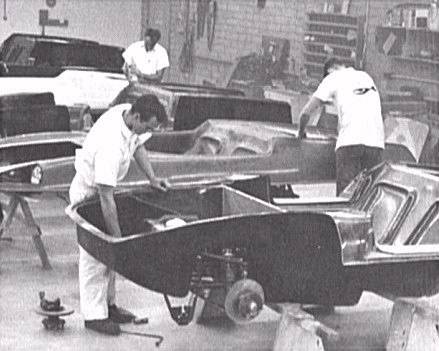 The Piranha was constructed at AMT's "Speed & Custom Division" shop at 1401 East Washington St., Phoenix, Arizona, pictured below. Company promotional information stated it had 40,000 sq. ft. and a staff of 28 craftsman. The plant had "complete facilities for design, construction and maintenance" of the various projects they were promoting besides the Piranha. They were also looking for business from the growing television and movie industries. 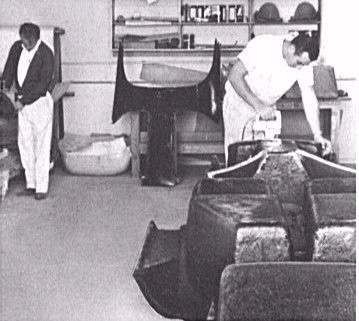 The worker on the right side trims excess material from an upsidedown fiberglass Piranha chassis. Note what appears to be a roof panel or mold in the background. Craftsmen prepare the chassis and upper bodies of two Piranhas. Note the front suspension attached to the first chassis. Here is a rare shot of the U.N.C.L.E. 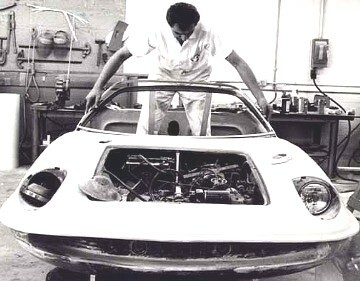 car during construction. A worker mounts a headlight in a painted Piranha body.